My previous elobeatlesforever (elobf) article looked at the stateside success of ELO's 1976 compilation "Olé ELO" (UA-LA630G) and the multi-coloured quartet of DJ only promos (SP-123) in gold, red, white and blue vinyl. It reminded Yours Truly KJS of another US promo issued just a few months later promoting the lead single from the next Electric Light Orchestra studio album "A New World Record". The 12" one-sided 33 1⁄3 RPM blue vinyl "Livin' Thing" (SP-137) also became (and continues to be) a collectors item for many ELO fans too as "Livin' Thing" became a worldwide smash, peaking at #4 in the UK (Jet/UA UP36184) and #13 respectively (backed by "Ma-Ma-Ma Belle") in the US (UA-XW888-Y). 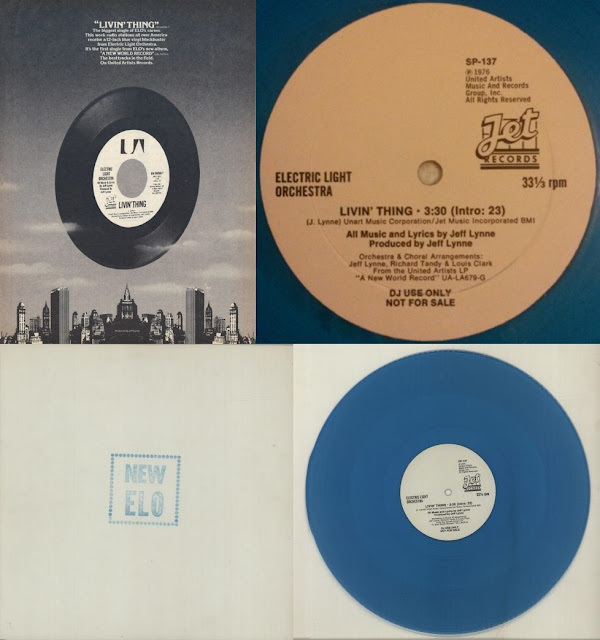 In becoming the first ELO 12" coloured vinyl single (as far as this writer is aware), "Livin' Thing" b/w "Fire On High" also saw official release in 7" blue vinyl here in the UK too, another first for the band as they began their rise to the summit of charts worldwide.